The Trump presidency gave our economy an injection of confidence. The recovery that started in 2011 was overall slow and showed signs already in 2014 of having reached its peak, but was reignited over last winter and stretched out through the summer. However, the Trump boost can only last for so long. Without substantial reforms to regulations, taxes and government spending, we will not see much more of economic expansion in this business cycle. A solid tax reform would have provided us with enough macroeconomic fuel to avoid a recession. That, however, won't happen: the Republican tax reform is not designed to, first and foremost, stimulate growth. Its primary goal is to secure tax revenue, and only secondarily to grow the economy. 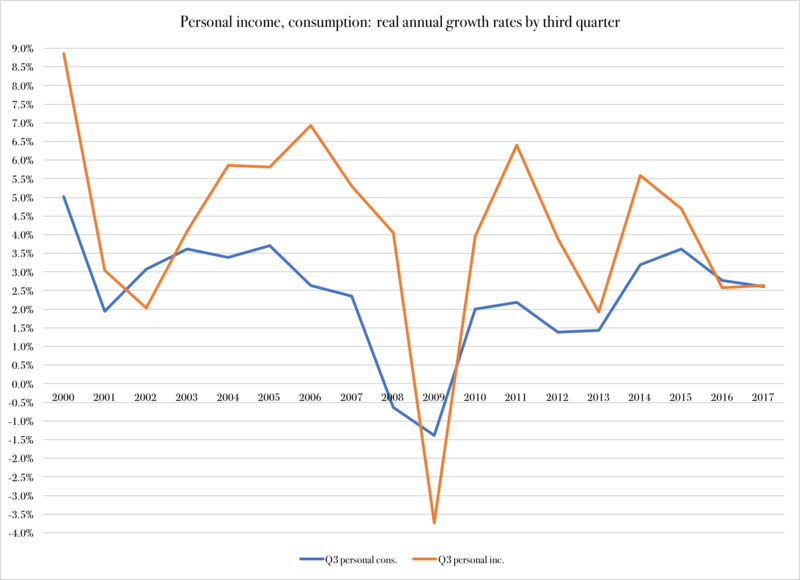 In its totality, the reform may minimize the next recession and could possibly even help us avoid it (though that is unlikely), but it will not boost GDP growth beyond the 2.5-percent territory where we seem to be stuck, temporary growth spurts notwithstanding. If compensation of employees had been at the same level now, in 2017, as it was in the five years preceding the Great Recession, consumers would have had $686.4 billion more in pre-tax income to spend or save from. It would also have meant that Trump's tax reform would have had a greater impact on household finances. On the one hand, the corporate-income tax goes down substantially, which will most likely help business investments. On the other hand, several other features put tax revenue above economic growth. As reported by the Wall Street Journal (December 5, print edition, section A), the Senate version of the tax-reform bill keeps the Alternative Minimum Tax (AMT) for corporations. This, the Journal reports, “gave the senators $40 billion over a decade to use on other priorities.” The AMT goes into effect when a taxpayer deducts “too much” from his regular tax bill. In the Senate version of the tax-reform bill many smaller businesses could end up losing deductions as a direct result of the corporate AMT. 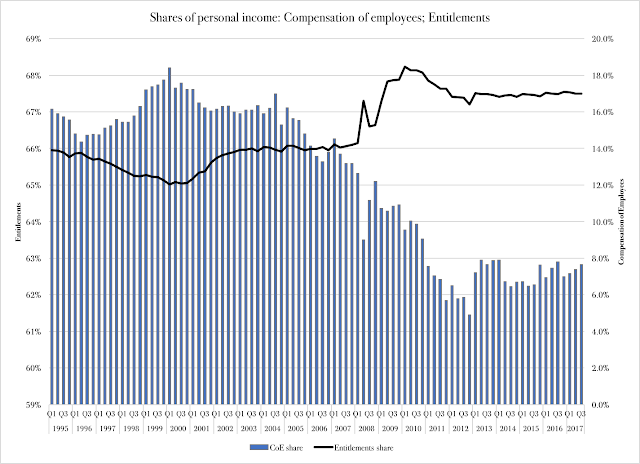 Since the tax reform does not change taxes on dividends and capital gains, the effects of any tax cuts on work-based incomes quickly vanish as incomes rise. According to IRS income-tax data from 2015: taxpayers making $20,000-$50,000 earn just over 80 percent of their income in the form of wages and salaries; Taxpayers earning more than $1 million earn less than 50 percent of their income from wages and salaries; Only 21 percent of incomes above $5 million is work based. Figure 2 above reinforces this conclusion: decreasing dependency on work-based income weakens the effects of tax reforms, especially when the distribution profile is such that more low-income households are completely liberated of paying federal income taxes. To see substantial growth in the wake of a tax reform, we would need to move in the direction of a flat federal tax - or, ideally, its repeal altogether. The latter is impossible so long as we have a welfare state (which we will for the foreseeable future) while the former is within the realm of the imaginable but not realistic in the short term. In conclusion: the best we can hope for with the tax reform is to sustain growth somewhere at or just below three percent. The most likely scenario, though, is a recession that is milder because of the tax reform, after which we return to the kind of moderate growth rates we have become accustomed to since the Great Recession ended.